Gathers in Eden and no longer gathers from trees. On the fifteenth Amos flew away from this life. The Holy Prophet Amos was a simple shepherd and a gatherer of sycamore fruit from Tekoa,* and was active when Uzziah was king of Judah (790-739 BC) and Jeroboam son of Jehoash was king of Israel (786–746 BC). Though he was from the southern Kingdom of Judah he preached in the northern Kingdom of Israel, particularly the cities of Samaria and Bethel. 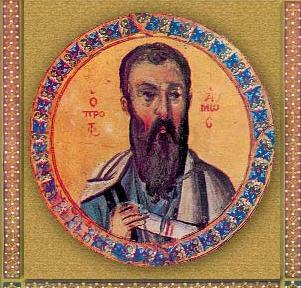 Amos wrote at a time of relative peace and prosperity, but also of neglect of God's laws and the paganization of the Jews. The Old Testament Book of Amos is attributed to him, which begins two years prior to the earthquake of 760 BC. Amos was the first of the prophets to write down the messages he had received. He has always been admired for the purity of his language, his beauty of diction, and his poetic art. Amos' prior professions and his claim "I am not a prophet nor a son of a prophet" (7:14) indicate that he was not from the school of prophets, which Amos claims makes him a true prophet. Amos' declaration marks a turning-point in the development of Old Testament prophecy. It is not mere chance that Hosea, Isaiah, Jeremiah, Ezekiel, and almost all of the prophets give first of all the story of their special calling. All of them thereby seek to protest against the suspicion that they are professional prophets, because the latter discredited themselves by flattering national vanities and ignoring the misdeeds of prominent men. Amos was called to preach in Bethel, where there was a royal sanctuary (7:13), and there to announce the fall of the reigning dynasty and of the northern kingdom due to their fall into paganism. But he was denounced by the pagan head priest Amaziah to King Jeroboam II and was advised to leave the kingdom. Being thus prevented from bringing his message to an end, and from reaching the ear of those to whom he was sent, he had recourse to writing. If they could not hear his messages, they could read them, and if his contemporaries refused to do so, following generations might still profit by them. No earlier instance of a literary prophet is known; but the example he gave was followed by others in an almost unbroken succession. It cannot be proved that Hosea knew the book of Amos, though there is no reason to doubt that he was acquainted with the latter's work and experiences. It is certain that Isaiah knew his book, for he follows and even imitates him in his early speeches. Amos rebuked King Jeroboam and his pagan priests for idolatry and dissuaded the people from worshiping the golden calves in Bethel, teaching them to worship the One Living God. The idolatrous priest Amaziah of the pagan temple particularly hated the Prophet Amos. Amos prophesied that the Assyrians will conquer Israel, that they will slay the king and the sons of Amaziah and that the Assyrian soldiers will defile Amaziah's wife before his eyes because he led the people into adultery with idols. For this he was subjected to beatings, although all of his predictions did materialize. Hosiah, the son of Amaziah, struck the Prophet on the head with a club and seriously wounded him. Still alive, the Prophet Amos reached his native village and died there around 745 BC. He is not to be confused with Amos, the father of the Prophet Isaiah. * Tekoa was a city of Judah, now in ruins, situated on an extended height, twelve miles south of Jerusalem, five miles south of Bethlehem. ** Compare Amos 5:21-24, 4:6, 5:18 with Isa. 1:11-15; Amos 4:7 et seq. with Isa. 9:7 et seq., 2:12. God the Word has revealed thee, O Prophet Amos, as a seer Of things sublime. He has been pleased with thy life and labours, for thou didst rebuke the ungodly and die as a martyr. Wherefore thou wast found worthy of eternal life, we beseech thee to intercede for us all. 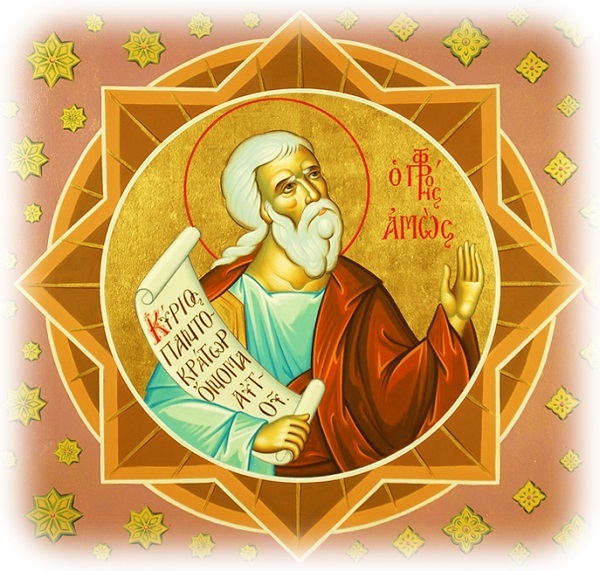 Thou didst purify thy burning heart in the Spirit, O glorious Prophet Amos. Thou didst receive the gift of prophecy from heaven, and proclaim throughout the world: This is our God and there is none beside Him.